PHILIPSBURG - St. Maarten now has its sixth prime minister in under eight years as a country-within-the-Dutch-Kingdom. The cabinet of Prime Minister Leona Romeo-Marlin took the oath of office before Governor Eugene Holiday this morning. One thing this new interim cabinet has in common with the past ones is it will have a contracted period in office. The cabinet is to serve until a new Parliament and Council of Ministers come into office after the February 26 snap parliamentary elections and the dissolution of Parliment per April 1. The Romeo-Marlin Cabinet comes into office following a change in the Parliament majority in October 2017. That change ended the majority support for what was the National Alliance-led William Marlin Cabinet. The cabinet is missing a separate minister for Tourism, Economic Affairs, Transportation and Telecommunications (TEATT). New Justice Minister Cornelius de Weever will hold the portfolio until a separate minister is installed. Joining Romeo-Marlin and De Weever in the cabinet are Ministers Michael “Mike” Ferrier (Finance), Emil Lee (Public Health, Social Development and Labour), Jorien Wuite (Education, Culture, Youth and Sports), Miklos Giterson (Public Housing, Spatial Development, Environment and Infrastructure) and Hasani Ellis (Deputy Minister Plenipotentiary). 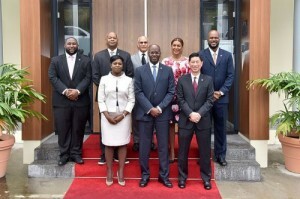 The Cabinet is supported in Parliament by the five seats of the United People’s (UP) party, two seats of the Democratic Party and independent Member of Parliament Chanel Brownbill. Romeo-Marlin’s tenure as prime minister folllows those of MP Sarah Wescot-Williams (two tenures), former Netherlands Antilles MP Marcel Gumbs, former MP William Marlin and now former Minister Rafael Boasman. She is the country’s second woman prime minister. The constituting meeting of the new cabinet along with the Governor was held in the Government Administration Building on Pond Island after the swearing-in ceremony at the Governor’s Office. In that meeting, each minister signed the decree regulating their portfolio, including the outline of the ministry for which they will deputize in the absence of a colleague. Based on the decree, Romeo-Marlin will be replaced by Lee, Ferrier by Wuite, De Weever by Romeo-Marlin, Wuite by Giterson, Lee by Ferrier, Giterson by De Weever and the TEATT minister (when appointed) by De Weever. If the minister and the deputizing one are absent at the same time, the portfolio will be filled by Romeo-Marlin or Lee. Should neither of those be present, the decree calls for the oldest minister present to take up the post. Ferrier is the oldest member of the cabinet. At that constituting meeting, the Governor said it was important to emphasize that St. Maarten and its people “are living in a pivotal moment in our history” due to Hurricane Irma. In spite of strides made in the part four months, there is still a way to go, he said. In moving forward, the Governor said the country’s Constitution provides “an anchor and blueprint” for all to work together to build St. Maarten and improve the lives of people. The preamble of the Constitution in essence, according to the Governor, says the people of St. Maarten are to committed to work together to better the country. The new ministers have a tough job ahead of them that include furthering the recovery process, working and executing the agreements made with the Dutch Government (aid and border control), presenting the overdue 2018 draft budget to Parliament. They also must meet the urgent need of the people in the sphere of housing and jobs creation, the Governor said. A “great responsibility” rests with the ministers who he wished “wisdom” in executing their duties.